Boasting a fantastic position on the renowned island of Maui, the Royal Lahaina Resort sits enviably upon twenty seven acres of gorgeous tropical gardens, welcoming any and all visitors to witness the beauty and splendour that runs rife across the entire island, all enhanced by the gorgeous views that stretch from the neighbouring islands to the Pacific Ocean’s horizon. 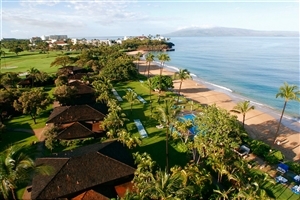 Granting easy access to the most exclusive spots of Kaanapali Beach, the resort invites guests to get up close and personal with the surrounding areas and uncover the idyllic hotspots and vantage points peppered throughout the region, while the resort’s own perks range from soothing and recreational facilities, a number of in-house dining venues and a wide range of accommodation types to choose from to suit all travellers, and when combined with an attentive level of service and a respect for Hawaiian tradition and culture, an exceptional island experience is guaranteed. 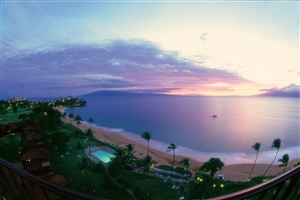 Showcasing some of the most gorgeous highlights found across the island of Maui, the Royal Lahaina Resort enjoys its enviable location where it is surrounded by twenty seven acres of exotic gardens and impressive beach access to what is considered one of the greatest beaches in the world, Kaanapali Beach. Inviting travellers the world over to experience the unforgettable sights, sounds and ambiance of the Hawaiian islands, the resort serves as the perfect getaway for those looking for something extra special, and with so much to do and see in and around the vicinity, a special occasion is easily attained. 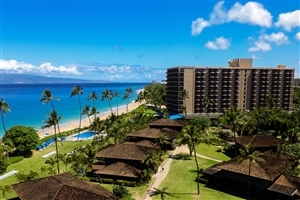 Whether it’s uncovering the vantage points and hotspots along the beachfront or simply basking beneath the sun in one of the spacious outdoor sections of the resort, there is something for everyone at this incredible Hawaiian haven. The Standard Room offers guests an elegantly designed accommodation with lavish, wooden furnishings complimented by modern amenities and a softened colour palette. The room boasts of a limited resort view. 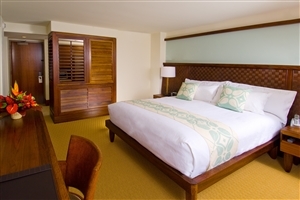 This room is located in the Lahaina Kai Tower. The Partial Ocean View Room offers guests a lavish accommodation intricately designed with plush commodities, teak wood furnishings and a gentle hue of colours. The room boasts of limited ocean views. The Ocean View Room offers guests a spacious accommodation fully fitted with wooden furnishings and enhanced by plenty of space, style and a softened colour palette. The room boasts of ocean views. The Deluxe Ocean View Room offers guests a beautifully furnished accommodation with teak wooden fittings all accompanied by lavish furnishings and gentle colours adorning the walls. The room boasts of superior views of the ocean. The Ocean Front Room offers guests a perfectly fitted accommodation fitted with elegantly designed commodities that range from plush comforts to teak wood furnishings and local works of art. The room boasts of full facing ocean views. The Garden View Cottage offers guests a beautifully decorated accommodation charmingly designed with island inspired decor and furnishings to create a truly blissful setting. The room features gorgeous garden views. This room is located with the Beach Cottages. The Deluxe Garden View Room offers guests a perfectly fitted accommodation boasting elegant furnishings, modern amenities and chic decor all inspired by the splendour of the island. The room features a private balcony that showcases views of the gardens. The Deluxe Garden View Cottage offers guests a welcoming accommodation ideally set out, granting plenty of room to roam and filled with lavish furnishings to enhance the island nature of the setting. The studio features a private balcony that showcases views of the garden. This studio is located with the Beach Cottages. The Ocean Front View Room offers guests a beautifully fitted accommodation that showcases plenty of plush commodities, island inspired decor and contemporary amenities. The room features amazing full ocean views. The Deluxe Ocean Front View Room offers guests an intricately designed accommodation that sets the tone for an incredible stay thanks to the lavish comforts and exotic, island style throughout the setting. The room features a private balcony that showcases full ocean front views. The Deluxe Ocean Front View Studio offers guests an idyllic accommodation where comfort and style come in abundance and when accompanied by plush furnishings and elegant island decor make for a truly impressive setting. The studio features a private balcony that boasts of unforgettable ocean front views. The One Bedroom Cottage Suite offers guests a fabulously furnished accommodation fitted with elegant comforts and modern amenities spread throughout the two storey setting. The suite features a separate living area, a kitchenette and two private balconies that overlook the garden or ocean. This suite is located with the Beach Cottages. The Two Bedroom Cottage Suite offers guests a generously spacious accommodation fitted with elegant comforts and modern amenities spread throughout the two storey setting. The suite features a separate living area, a kitchenette and a private balcony that overlook the garden. The Oceanfront Molokai Suite offers guests a unique accommodation that showers visitors with comfort, style and space, providing plenty of plush comforts along with an aesthetically pleasing colour palette to ensure a memorable stay. 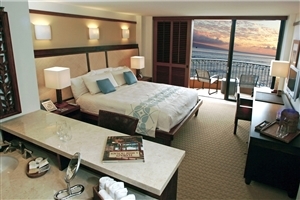 The suite features a separate living area and boasts of beautiful ocean views. This suite is located in the Lahaina Kai Tower. The Oceanfront Molokai Suite offers guests a wonderfully designed accommodation whose intricately designed furnishings and plush comforts compliment the beautiful exterior vistas. 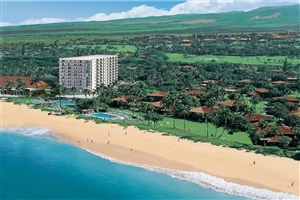 The suite features a separate living area and boasts of views looking out towards the ocean and Lanai Island. The Two Bedroom Deluxe Cottage Suite offers guests a generously spacious accommodation elegantly furnished with plush comforts, modern amenities and a host of intricately designed furnishings to help travellers ease back into a blissful setting. The suite features a separate living area, a kitchenette and a private balcony that boasts of views overlooking the resort garden. The Two Bedroom Junior Beach Cottage Suite offers guests a palatial accommodation that grants an abundance of style, space and comfort thanks to the many plush furnishings and contemporary fittings housed within. The suite features a separate living area and a private balcony that boasts of views looking out to the Pacific Ocean. The Royal Beach House Suite offers guests an opulent accommodation whose many luxuries, comforts and commodities are fit for a king. The suite features a separate living area, a private outdoor section, a swimming pool and direct beach access for an enhanced occasion. Royal Ocean Terrace – Sample some of Hawaii’s most sumptuous regional dishes at this casual, open-air setting. Royal Scoop – Treat yourself to a variety of tasty pastries, breakfast favourites and light snacks at this eatery that offers outdoor seating or food on the go. Beach Bar – Take a refreshing time out at this poolside beach bar with an innovative cocktail or craft brew. Royal Trading Company – Grab a bite to eat at this grab-n-go shop outlet that brings yummy snacks together with fresh-made gourmet items to enjoy in the comfort of your own lanai. Myths of Maui Luau – Watch as locals entertain you in a traditional Hawaiian experience consisting of dance, music and food.